Partly cloudy early with increasing clouds overnight. Low around 40F. Winds E at 5 to 10 mph. 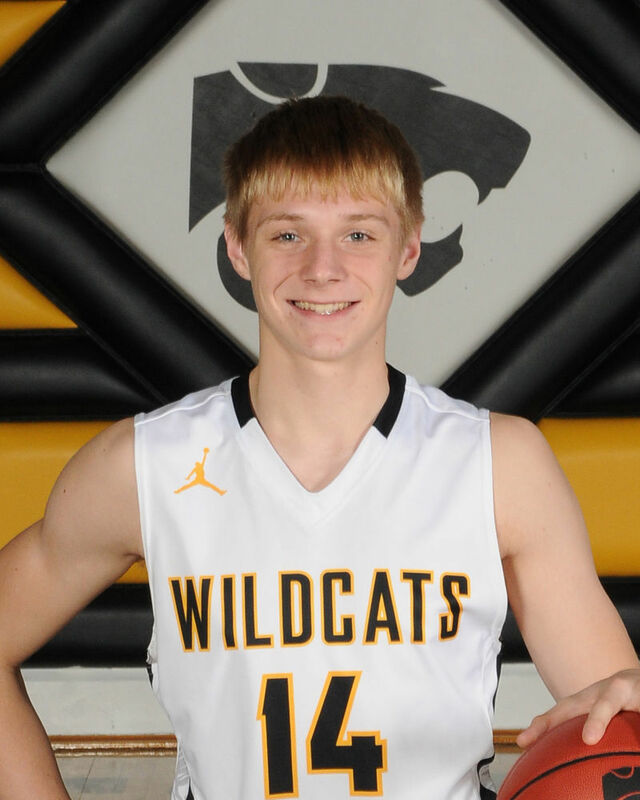 GARWIN — Janesville found itself in a battle for the opening half Friday, but the Wildcats’ dynamic duo of Codey Hicks and Spencer Hoff eventually proved too much as the Wildcats pulled away from GMG 80-62 in an Iowa Star Conference crossover game. Hicks poured in 31 points, leaving him just eight shy of 1,000 for his career, and Hoff added 22 as Janesville (11-2) pulled away from a 37-29 halftime lead. GMG (5-6) blistered the nets with 11 3-point baskets. Janesville faces a Tuesday showdown against Don Bosco in a key Iowa Star North matchup. DUNKERTON 66, TRIPOLI 28: Dunkerton extended its winning streak to six with a 66-28 win over Tripoli. Brady Happel’s 22 points led the Raiders as they upped their overall record to 10-2. In conference play, Dunkerton is now 7-1 and one-half game ahead of Janesville (6-1). JESUP 49, UNION 48, OT: Union’s effort to claim a win at Jesup fell short as the J-Hawks pulled out a win in overtime. Jesup led 29-20 at halftime and 37-34 after three quarters only to see Union tie it at 45. Both teams had a chance to win in regulation, but a Union turnover followed by a Jesup missed shot added the extra period. Caleb Reel scored 21 points and Keegan Block 15 for Union (1-9, 1-8) while Josh Johnson had 11 and Cooper Fuelling and Landon Borrett 10 each for Jesup. APLINGTON-PARKERSBURG 58, HUDSON 43: Aplington-Parkersburg took control in the second and third quarters and topped Hudson in North Iowa Cedar League action. After an 18-18 first-quarter tie, the Falcons (10-2, 8-1) outscored the Pirates (4-7, 3-6) 26-13 over the middle two periods to take command. Carter Cuvelier had 18 points and Aaron Bartels 17 for A-P, while Jacob Murray was 9 of 12 from the field for 18 points to lead Hudson. BENTON COMMUNITY 68, INDEPENDENCE 37: Jack Shaw scored 15 points and 10 other Bobcats scored as Benton cruised past Independence. DIKE-NEW HARTFORD 73, DENVER 64: Dike-New Hartford made 28 field goals in 46 attempts and overcame a 28-point performance by Denver’s Kyler Matthias in a narrow NICL win. The Wolverines (9-1, 8-1) led 39-36 at halftime and were never able to put Denver (10-3, 6-3) away. Matthias finished with eight 3-point field goals in 16 attempts. Cade Fuller led D-NH with 17 points and Colton Harberts added 15. JESUP 49, UNION 43: Brittany Lingenfelter scored 15 points to lead Jesup past Union in North Iowa Cedar League action. The J-Hawks (9-4, 6-3) led 21-19, but Union (2-9, 2-9) tied it at 31 with three minutes to go in the third. Jesup then regained the lead and never lost it. Junior Natalie Tecklenburg had 13 points to lead Union. GRUNDY CENTER 67, EAST MARSHALL 26: Class 2A’s top-ranked Grundy Center set the tone early and crushed East Marshall in a NICL West matchup. The Spartans (11-0, 8-0) built a 34-12 halftime lead and got scoring from 11 players. Kylie Willis led the way with 16 points and Hailey Wallis added 11. DIKE-NEW HARTFORD 60, DENVER 34: Ten girls played for Dike-New Hartford and eight of them scored as the Wolverines improved to 8-2 in the conference and 9-2 overall. Katie Knock led 10th-rated D-NH with 17 points while Kambrie Clinton had 17 for the Cyclones. DECORAH 41, CHARLES CITY 35: Decorah overcame a three-point deficit early in the fourth quarter and surged past Charles City for its first win of the season. Emma Nierengarten’s 13 points led Decorah while Jodi Sindlinger finished with 12 for winless Charles City. COLO-NESCO 49, NORTH TAMA 25: Eleventh-ranked Colo-Nesco’s defense smothered North Tama in an Iowa Star game. North Tama (2-12, 0-7) scored just 13 points through the first three quarters. APL.-PARKERSBURG 42, HUDSON 32: The Aplington-Parkersburg girls scored the first eight points and never trailed as they defeated Hudson. The Pirates got within five ooints late in the third period, but a 9-2 A-P run ended Hudson’s chances. Sophia Jungling scored 13 points for the Falcons (13-1, 9-1), and Maddie McKenna matched that total for Hudson (7-5, 5-4). JANESVILLE 82, GMG 38: Janesville had five players score in double figures and the Wildcats’ defense had 21 steals in an Iowa Star crossover rout of GMG. Alisa Bengen led eighth-ranked Janesville (11-2) with 22 points. Kennedy Rieken added 15, Briana Baker-Bruce 13, Bailey Hoff 12 an Lily Liekweg 10. Rieken also had eight steals. UNION (2-9, 2-9) — Emma Shirk 3, Allie Carty 6, Allie Driscol 3, Natalie Tecklenburg 13, Megan Carty 10, Kaylin Brustkern 6, Sam Glenn 2. JESUP (9-4, 6-3) — Payton McHone 12, Emily Treptow 9, Amanda Treptow 6, Leah Borgerding 2, Brittany Lingenfelter 15, Jaima Tonne 6. EAST MARSHALL (6-8, 2-5) — Melinda Puumala 5, Rachael McAnulty 2, Madison Farrington 8, Maria Rasmusson 3, Olivia Terrones 6, Abby Ryan 2. GRUNDY CENTER (11-0, 8-0) — Reegen Zinkula 3, Hailey Wallis 11, Maddie McMartin 3, Sydney Mathews 7, Shelby Rivera 2, Sarah Lindeman 6, Cora Saak 9, Kylie Willis 16, Brooke Flater 6, Leslie Homeister 2, Brittany Burroughs 2. DIKE-NEW HARTFORD (9-2, 7-2) — Ellie Foster 12, Rylee Wessely 2, Taylor Kvale 4, Morgan Weber 13, Katie Knock 17, Sophia Hoffmann 6, Jill Eilderts 6. DENVER (7-6, 4-6) — Jaden McMahon 3, Lila Meyer 6, Emma Hennessey 3, Sarah Steege 2, Kambrie Clinton 17, Reese Johnson 3. CHARLES CITY (0-12, 0-7) — Lynn Hoeft 4, Lydia Staudt 9, Kara Hoffman 2, Liz Fiser 2, Ashlyn Hoeft 6, Jodi Sindlinger 12. DECORAH (1-13, 1-6) — Ambria Pipho 7, Abigail Milburn 6, Amanda Kuehner 5, Emma Nierengarten 13, Skyler Malone 10. COLO-NESCO (10-1, 7-0) — Faith Vincent 9, Lauryn Hill 8, Emily Hostetler 2, McKenzie Niemeyer 3, Rylee Purvis 10, Megan Carlson 5, Emma Stalzer 5. NORTH TAMA (2-12, 0-7) — Carlie Gorder 4, Katie Kopriva 6, Karly Jans 3, Hope Brubaker 3, Rylee McLean 3, Abby Deboef 2, Madeline Espenschied 4. HUDSON (7-5, 5-4) — Morgan Galbraith 3, Maddie McKenna 13, Abby Gaudian 2, Whitley Galbraith 2, Jessica Carolan 5, Sara Hansen 6. APLINGTON-PARKERSBURG (13-1, 9-1) — Sophia Jungling 13, Karson DeGroote 2, Megan Johnson 7, Jenna Bruns 7, Avari Everts 8, Ainsley Brungard 5. JANESVILLE (11-2) — Lily Liekweg 10, Bailey Hoff 12, Alisa Bengen 22, Kennedy Rieken 15, Lilly Nielsen 2, Briana Baker-Bruce 13, Noami Hovenga 2, Gabby Gergen 6. GMG (7-5) — Zoe Duncan 9, Mable Dieleman 2, Belle Duncan 2, Tory Novotny 4, Emily Vaughn 13, Kelsey Vaverka 7, Jordan Yilek 1. JANESVILLE (11-2) — Josh Hahn 8, Caden Conrad 13, Leo Dodd 2, Joey Carlson 2, Christian Mauer 2, Codey Hicks 31, Spencer Hoff 22. GMG (5-6) — Justin Savadty 5, Kolton Gill 12, Aaron Fleming 11, Brock Baldozo 2, Brayden Peterson 11, Blaze Krull 3, Avery Bryant 15, Cooper Langenbau 3. TRIPOLI (5-6, 4-4) — Seth Boeckmann 4, Conner Piehl 7, Gavin Shepard 2, Blake Bockhaus 11, Dawson Bergmann 4. DUNKERTON (10-2, 7-1) — Zach Johnson 9, Brady Stone 11, Tylin Williams 13, Jacob Brandt 1, Brady Happel 22, Jared Salisbury 2, Riley Tisue 2, Kolby Rich 4, Gabe Heideman 2. UNION (1-9, 1-8) — Caleb Reel 21, Keegan Block 15, Devin Reel 9, Silver Schmitz 1, Carter Asmussan 2. JESUP (6-6, 5-4) — Cade Nolan 7, Josh Johnson 11, Brodie Kresser 6, Cooper Fuelling 10, Landon Borrett 10, Ross Mead 5. INDEPENDENCE (2-9, 1-4) — Jaxon Miller 4, Kaleb Lamphier 4, Tyler Till 2, Ethan McCormick 3, Kaden Howard 5, Lamphier 4, Sean Geertsema 5, Blake Bartz 10. BENTON COMMUNITY (6-6, 4-2) — Bennett Gorkow 2, Simon Carlson 4, Dylan Spina 13, Jacob Thompson 2, Nathan Michels 11, Jack Shaw 15, Turner Schroeder 7, Crowsey 3, Sam Shaw 2 Grant Embretson 1, Jake Stocker 8. HUDSON (4-7, 3-6) — Ben Kelly 6, Payton Stuart 2, Bryce Griffin 8, Jacob Myers 2, Jacob Murray 18, Carter Swope 7. APLINGTON-PARKERSBURG (10-2, 8-1) — Aaron Bartels 17, Aaron Price 7, Carter Cuvelier 18, Sam Bachman 6, Junior Bodden 4, Josh Haan 2, Riley Oberhauser 4. DIKE-NEW HARTFORD (9-1, 8-1) — Tim Koop 8, Cade Fuller 17, Ryan Moore 6, Isaac Jorgensen 4, Dane Fuller 11, Derek Kinney 8, Colton Harberts 15, Owen Goos 4. DENVER (10-3, 6-3) — Isaac Besh 10, Bryce Phelps 10, Kyler Matthias 28, Alex Gebel 6, Devin Baas 2, Will Curtis 8. UNION (2-9, 2-9) -- Emma Shirk 3, Allie Carty 6, Allie Driscol 3, Natalie Tecklenburg 13, Megan Carty 10, Kaylin Brustkern 6, Sam Glenn 2. JESUP (9-4, 6-3) -- Payton McHone 12, Emily Treptow 9, Amanda Treptow 6, Leah Borgerding 2, Brittany Lingenfelter 15, Jaima Tonne 6. EAST MARSHALL (6-8, 2-5) -- Melinda Puumala 5, Rachael McAnulty 2, Madison Farrington 8, Maria Rasmusson 3, Olivia Terrones 6, Abby Ryan 2. GRUNDY CENTER (11-0, 8-0) -- Reegen Zinkula 3, Hailey Wallis 11, Maddie McMartin 3, Sydney Mathews 7, Shelby Rivera 2, Sarah Lindeman 6, Cora Saak 9, Kylie Willis 16, Brooke Flater 6, Leslie Homeister 2, Brittany Burroughs 2. DIKE-NEW HARTFORD (9-2, 7-2) -- Ellie Foster 12, Rylee Wessely 2, Taylor Kvale 4, Morgan Weber 13, Katie Knock 17, Sophia Hoffmann 6, Jill Eilderts 6. DENVER (7-6, 4-6) -- Jaden McMahon 3, Lila Meyer 6, Emma Hennessey 3, Sarah Steege 2, Kambrie Clinton 17, Reese Johnson 3. CHARLES CITY (0-12, 0-7) -- Lynn Hoeft 4, Lydia Staudt 9, Kara Hoffman 2, Liz Fiser 2, Ashlyn Hoeft 6, Jodi Sindlinger 12. DECORAH (1-13, 1-6) -- Ambria Pipho 7, Abigail Milburn 6, Amanda Kuehner 5, Emma Nierengarten 13, Skyler Malone 10. COLO-NESCO (10-1, 7-0) -- Faith Vincent 9, Lauryn Hill 8, Emily Hostetler 2, McKenzie Niemeyer 3, Rylee Purvis 10, Megan Carlson 5, Emma Stalzer 5. NORTH TAMA (2-12, 0-7) -- Carlie Gorder 4, Katie Kopriva 6, Karly Jans 3, Hope Brubaker 3, Rylee McLean 3, Abby Deboef 2, Madeline Espenschied 4. HUDSON (7-5, 5-4) -- Morgan Galbraith 3, Maddie McKenna 13, Abby Gaudian 2, Whitley Galbraith 2, Jessica Carolan 5, Sara Hansen 6. APLINGTON-PARKERSBURG (13-1, 9-1) -- Sophia Jungling 13, Karson DeGroote 2, Megan Johnson 7, Jenna Bruns 7, Avari Everts 8, Ainsley Brungard 5. JANESVILLE (11-2) -- Lily Liekweg 10, Bailey Hoff 12, Alisa Bengen 22, Kennedy Rieken 15, Lilly Nielsen 2, Briana Baker-Bruce 13, Noami Hovenga 2, Gabby Gergen 6. GMG (7-5) -- Zoe Duncan 9, Mable Dieleman 2, Belle Duncan 2, Tory Novotny 4, Emily Vaughn 13, Kelsey Vaverka 7, Jordan Yilek 1. JANESVILLE (11-2) -- Josh Hahn 8, Caden Conrad 13, Leo Dodd 2, Joey Carlson 2, Christian Mauer 2, Codey Hicks 31, Spencer Hoff 22. GMG (5-6) -- Justin Savadty 5, Kolton Gill 12, Aaron Fleming 11, Brock Baldozo 2, Brayden Peterson 11, Blaze Krull 3, Avery Bryant 15, Cooper Langenbau 3. TRIPOLI (5-6, 4-4) -- Seth Boeckmann 4, Conner Piehl 7, Gavin Shepard 2, Blake Bockhaus 11, Dawson Bergmann 4. DUNKERTON (10-2, 7-1) -- Zach Johnson 9, Brady Stone 11, Tylin Williams 13, Jacob Brandt 1, Brady Happel 22, Jared Salisbury 2, Riley Tisue 2, Kolby Rich 4, Gabe Heideman 2. UNION (1-9, 1-8) -- Caleb Reel 21, Keegan Block 15, Devin Reel 9, Silver Schmitz 1, Carter Asmussan 2. JESUP (6-6, 5-4) -- Cade Nolan 7, Josh Johnson 11, Brodie Kresser 6, Cooper Fuelling 10, Landon Borrett 10, Ross Mead 5. INDEPENDENCE (2-9, 1-4) -- Jaxon Miller 4, Kaleb Lamphier 4, Tyler Till 2, Ethan McCormick 3, Kaden Howard 5, Lamphier 4, Sean Geertsema 5, Blake Bartz 10. BENTON COMMUNITY (6-6, 4-2) -- Bennett Gorkow 2, Simon Carlson 4, Dylan Spina 13, Jacob Thompson 2, Nathan Michels 11, Jack Shaw 15, Turner Schroeder 7, Crowsey 3, Sam Shaw 2 Grant Embretson 1, Jake Stocker 8. HUDSON (4-7, 3-6) -- Ben Kelly 6, Payton Stuart 2, Bryce Griffin 8, Jacob Myers 2, Jacob Murray 18, Carter Swope 7. APLINGTON-PARKERSBURG (10-2, 8-1) -- Aaron Bartels 17, Aaron Price 7, Carter Cuvelier 18, Sam Bachman 6, Junior Bodden 4, Josh Haan 2, Riley Oberhauser 4. DIKE-NEW HARTFORD (9-1, 8-1) -- Tim Koop 8, Cade Fuller 17, Ryan Moore 6, Isaac Jorgensen 4, Dane Fuller 11, Derek Kinney 8, Colton Harberts 15, Owen Goos 4. DENVER (10-3, 6-3) -- Isaac Besh 10, Bryce Phelps 10, Kyler Matthias 28, Alex Gebel 6, Devin Baas 2, Will Curtis 8.